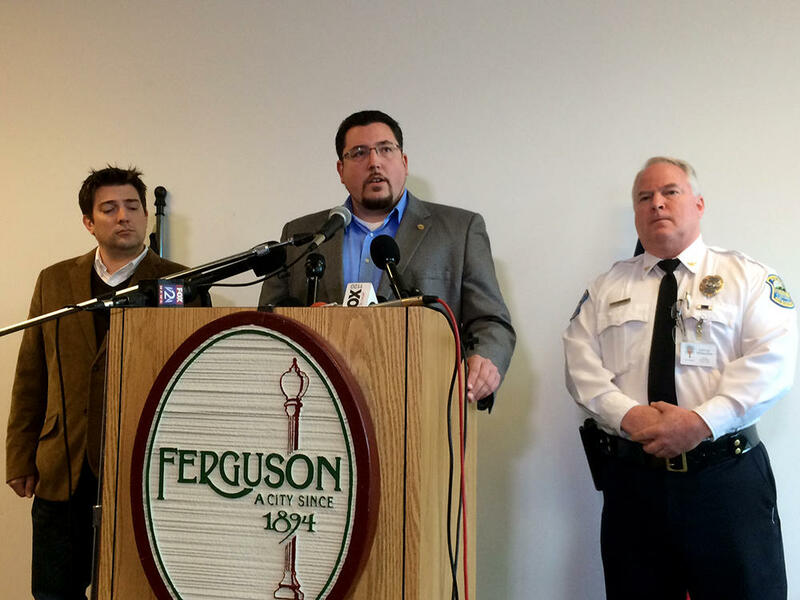 Ferguson City Manager John Shaw, Mayor James Knowles and Police Chief Tom Jackson on Sunday, November 30, 2014. Mayor James Knowles said they could not immediately confirm the resignation Saturday because city attorney Stephanie Karr did not receive the resignation letter until several hours after media broke the story. Wilson did call Ferguson Police Chief Tom Jackson and tell him he was resigning but it wasn’t official until they received the letter, Knowles explained Sunday during a news conference at the Ferguson Community Center. Knowles also said Wilson will not be receiving a severance package. From the wording of Wilson’s resignation letter, it appeared that he was resigning in response to specific threats against Ferguson police. Wilson’s attorney, Neil Bruntrager, gave further credence to that impression when he appeared on Fox News Sunday. At the news conference, Jackson confirmed that he had spoken with Wilson earlier in the week, but avoided drawing a direct link between their conversation and Wilson’s resignation. "It’s been a threatening environment all along, everybody knows that. I have not spoken to Officer Wilson since prior to the shooting, so we touched on a lot of threats and caught up (during the phone call),” Jackson said. “But there was no specific threat at that time." Knowles also said he was unaware of Wilson being threatened to resign by a certain date. “I don’t know if anybody made a threat and gave him a deadline. We didn’t make a threat and give him a deadline. If someone else did, if there was some group that did, I’m not aware of that intelligence, but that may be the case,” Knowles said, adding that neither he nor Jackson asked Wilson to resign. 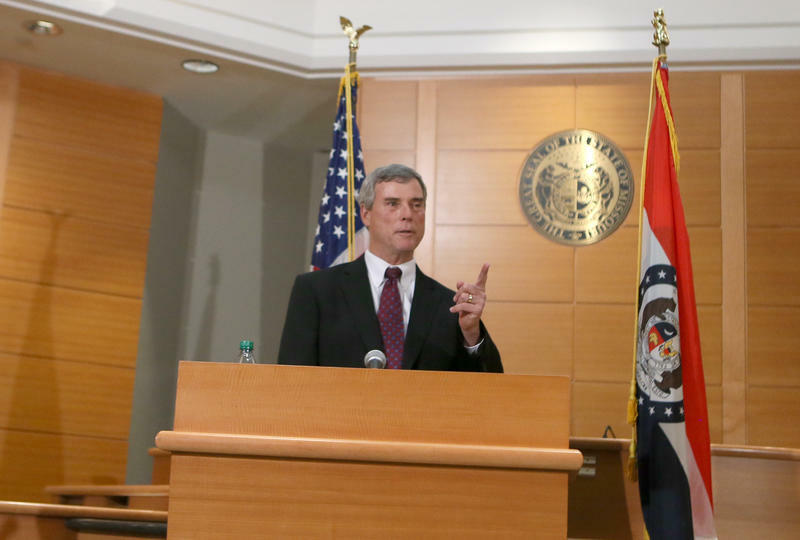 In the months since Wilson shot and killed Michael Brown, there have also been many calls for Jackson to resign, but at the press conference Sunday he again said that he has no intention to do so. Immediately after announcing Wilson’s resignation, Knowles declared that it was time to look to the future and begin to heal the rift developed between residents and police. “It’s our number one goal to bridge the gap between those who feel there is a divide between them and law enforcement,” Knowles said. The formation of a civilian police review board. An increase in the monthly stipend for police officers who live in Ferguson, from $100 to $300. A scholarship program to recruit African-Americans to the Ferguson Police Department. “These are individuals who we’re going to pay for (them) to go to the academy because we want them to work for the city of Ferguson as a police officer,” Knowles explained, adding that it will take a while for the scholarship to impact department demographics because the recruits will first have to go through the police academy. In return for the scholarship to the police academy, recipients will pledge to work for the department for two years. Story as of 8:25 p.m. Saturday, November 29. 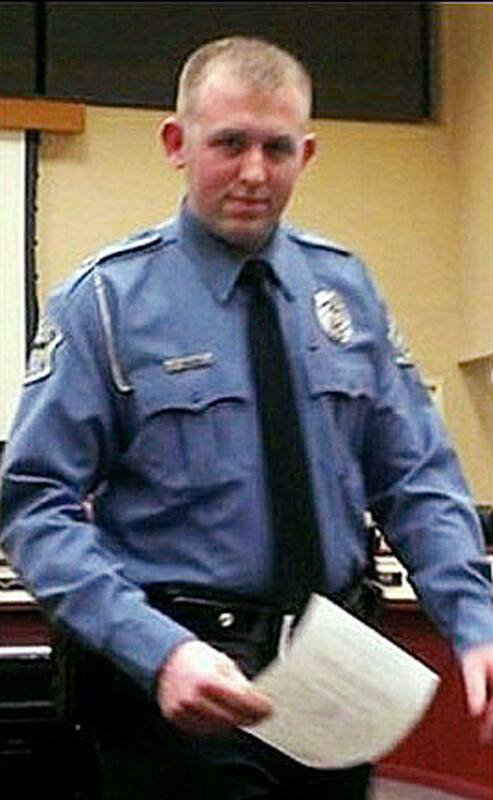 Officer Darren Wilson has submitted his resignation from the Ferguson Police Department, less than a week after a grand jury decided not to indict him for the fatal shooting of unarmed 18-year-old Michael Brown on Aug. 9. Ferguson Police Officer Darren Wilson said he hopes his resignation "will allow the community to heal." Wilson, 28, had been on administrative leave since the shooting. His attorney Neil Bruntrager said Wilson's resignation is effective immediately upon announcement Saturday. However, a spokeswoman for the city of Ferguson said city officials have not yet received the resignation letter, and said Chief Tom Jackson is not commenting. I, Darren Wilson, hereby resign my commission as a police officer with the City of Ferguson effective immediately. I have been told that my continued employment may put the residents and police officers of the City of Ferguson at risk, which is a circumstance I cannot allow. For obvious reasons, I wanted to wait until the grand jury made their decision before I officially made my decision to resign. It was my hope to continue in police work, but the safety of other police officers and the community are of paramount importance to me. It is my hope that my resignation will allow the community to heal. I would like to thank all of my supports and fellow officers throughout this process. Wilson spent four years on the Ferguson police force. Before that, he spent two years in the neighboring city of Jennings before that department was disbanded. Chief Tom Jackson said in August that Wilson had no disciplinary action taken against him in that time. Wilson's resignation won't cost him his peace officer license, essentially his ability to be a police officer in the state of Missouri. But former Ferguson Mayor Brian Fletcher said while Wilson's decision to resign wasn't unexpected and that he didn't have to resign, he doesn't see Wilson ever being a police officer again. "Whether officially his license is removed or unofficially, I think it would be very unlikely that he’ll ever seek law enforcement again, unless it’s in a private manner," Fletcher said. "He's had a chance to think about this. For everybody's sake, both the community and Darren Wilson's sake and the Brown family, I think he’s made the right decision." Saint Louis University law professor Roger Goldman said because the grand jury decided not to charge Wilson with a crime, it would be difficult for an administrative commission to strip Wilson of his license. The grand jury heard evidence for 25 days total over the course of about three months. Wilson told grand jurors that he feared for his life when Brown hit him and grabbed for his gun. In subsequent interviews, he said while he feels sympathy for the Brown family over the loss of their son, he felt he did his job correctly. Violent protests erupted after the grand jury's decision was announced Monday night by St. Louis County Prosecutor Bob McCulloch. More than a dozen buildings in Ferguson and neighboring towns burned or were looted in riots. St. Louis Public Radio has reached out to the Brown family's attorney for comment on Wilson's resignation, but they did not immediately return calls or emails. Brown's family has previously said they are still hoping the U.S. Department of Justice brings federal civil rights charges against Wilson. The federal government is also doing what is called a "pattern and practice" investigation into the Ferguson police department. In the meantime, Fletcher said he hopes both the Brown family and Wilson's family can "find peace and comfort" and that the community can move forward. "I hope the community can start to heal and recover," he said. "It’s been a tragic situation for all involved, including businesses and residents. I’m sure no one wanted this to happen by any means, and we want them all blessed by God." The resignation was not surprising to activists in the community, but few said they thought it would help. Charles Wade, who helped create Operation Help Or Hush to provide support to protesters and community activists, said on Twitter that a resignation was not enough. Patricia Bynes, the Democratic committeewoman for Ferguson Township, said Wilson was too low on the totem pole to make a difference. "There are so many other people who are responsible through bad decision-making for getting us to this point," Bynes said. "The governor. I think we need to be questioning [St. Louis County] chief [Jon] Belmar, [Ferguson police chief Tom] Jackson, Bob McCulloch. There are so many other people involved who need to be held accountable and responsible." Bynes said she would like to see hearings in Jefferson City as to why the National Guard was not deployed to prevent looting and arson after the grand jury decision was announced on Monday. The mayors of Dellwood and Ferguson have asked similar questions.